My good friend Alice of One Nail To Rule Them All has recently been involved with the start up of a new nail polish company called Graffiti Nails. 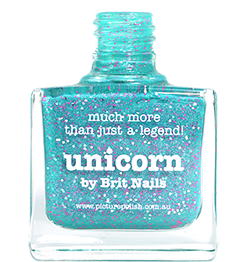 There are currently 13 colours available (plus a top coat and base coat) and I have 3 to show you today! I always love seeing new British brands, and this is extra exciting because it involves a friend! As well as the colours already available, there are plans for nail wraps which will feature Alice's designs. Really can't wait to see those! At the moment Graffiti Nails is only available in the UK, but there are plans to go international. I love the chunky square bottles, and the square lid comes off to reveal a round lid underneath, so don't worry about having to apply with a square lid! Tuscany is a lovely sunset orange crelly. I used 3 thin coats plus top coat. I was surprised how fast this dried, it didn't take long at all! Pistachio is a turquoise creme. Being a turquoise obsessive, this is my favourite! This was 2 easy coats plus top coat. Again this dried quickly. 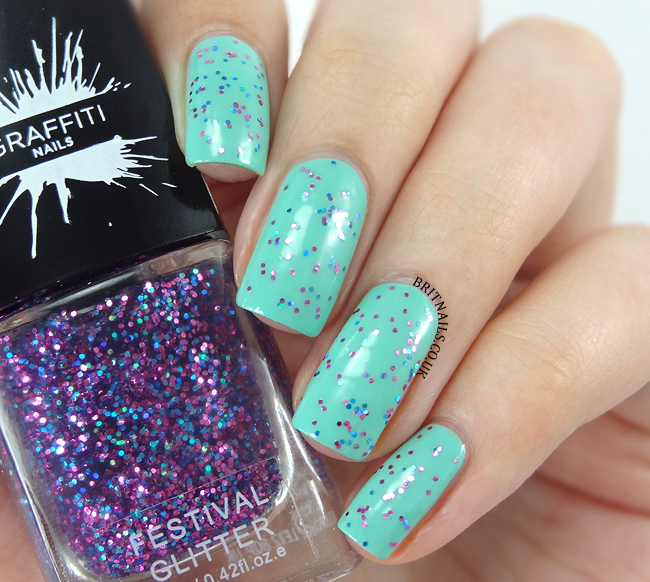 Festival Glitter is a sparkly mix of tiny blue and purple hex glitters, with a bit of iridescent sparkle thrown in. I've used 1 coat over Pistachio, plus top coat, but it's easy to build up if you prefer a denser look. These are great quality, especially at only £3.99 each! They're nice and glossy and I'm impressed with the drying time. I can't wait to see what else Graffiti Nails comes up with in the future! You can buy these polishes at the Graffiti Nails website, priced £3.99 each. Postage is free if you buy 3 or more polishes! Great colors! And that glitter is so cute! These colors are all fabulous on you! I like them all, Tuscany has a nice shade of orange that brings 70's to my mind somehow with a touch of up-to-date finish. The glittery one is funny. I don't know, maybe a bit too simple for me, but cute. Sooooo... I just placed an order for 5 of them. Including the three you just swatched! Beautiful swatches.